Drive home in a used INFINITI luxury car or SUV that’s sure to add new thrills to your time on the road. Whether you want a used INFINITI QX60 or a pre-owned INFINITI Q50, you’ll find that our INFINITI dealership near Peters Township, PA, has a variety of used INFINITI models on our lot. Looking for something else entirely? We have used cars for sale from a range of makes, allowing you to get the keys to exactly the vehicle you want. 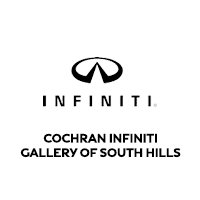 Cochran INFINITI Gallery of South Hills even has Certified Pre-Owned INFINITI models for sale, so you can get a like-new INFINITI for a used-car price that’s been thoroughly inspected. Browse our used INFINITI specials to save big on a used INFINITI QX80 or pre-owned Q70!